Look what I got!! Thanks, Mom and Dad! I am assuming this was an early birthday present. My parents had gotten ice cream makers for both my cousins for their weddings this weekend. Out of the trunk of the van comes a Cuisinart 7-cup Food Processor as well! It is something I needed desperately last weekend, when making the hand-numbing wrist-aching layers of frozen grated dough for the Hungarian Shortbread. It was delicious, but it would have been much nicer to use the grater on a food processor! And now I can. Today during my lunch break I made Julia’s gallette dough in the food processor. It took five minutes! 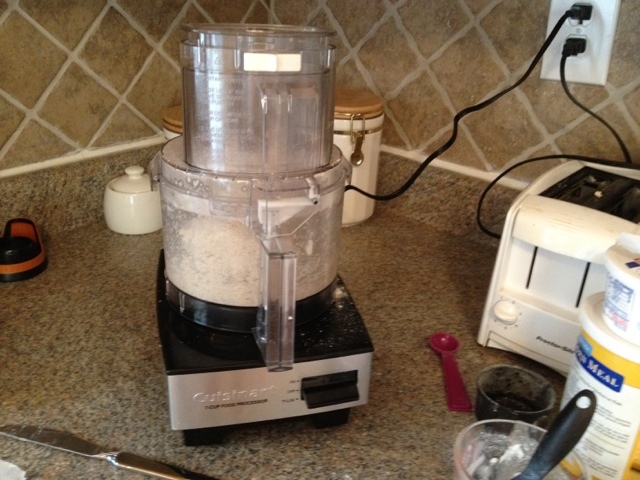 I am so excited to keep using the food processor, and I already found some pizza dough recipes to try later this week. Want to come over for dinner?! Nice to see that I’m not the only one extremely happy to get a new kitchen gadget. First thing I made was pizza dough. Enjoy! Pizza dough was second for me! So simple, can’t wait to make it again.